Our Featured Product is our affordable Drupal Starter Template which provides a properly setup and connected Drupal landing page linked to social media, search engines and directory listings. You are free to expand and develop the Drupal site using our resource libraries as reference and if you need our help, just drop us a line. The Drupal services we provide cover a wide range of topics ranging from inexpensive Drupal Templates to full-blown Drupal development suites. Whether you need help in starting a Drupal website, are in need of a Drupal Template installation or require an expansion to your existing Drupal website, count on Shaw Website Design Group to provide the solutions you need at an affordable price. Shaw Website Design offers you a flexible way to launch your creative message using Drupal. Market your services using Drupal today. Single .com domain name registration. Main menu Layer will be linked to 3 blank pages. No charge for Home page graphics. Google and Bing search engine awareness. Backlinks from regional directory services linked. Linkedin, Google+ and Facebook connections to your Drupal website. about our Drupal product line. Want more info on Drupal? Product description: A Drupal Starter Template web page will be developed and synchronized to Google, Bing, Facebook, Twitter, LinkedIn and Email accounts. An affordable way to establish your web presence. 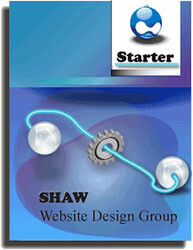 Shaw offers affordable Drupal Starter Templates and Drupal Development suites.